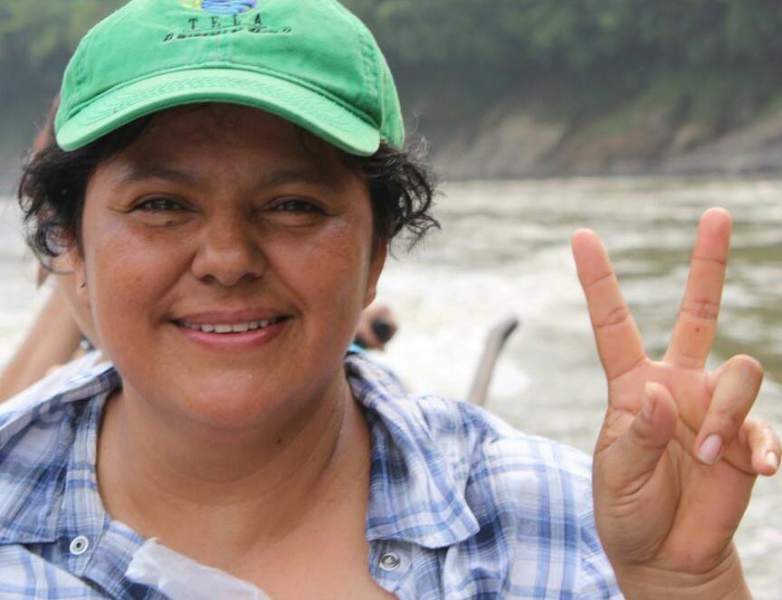 Yesterday, it had been a year since Berta Cáceres was murdered in her home. Berta was an environmental and indigenous people activist, winner of the Goldman award in 2015 for her dedication and troubles. Her dedication and troubles led her to have armed guards (which should have been issued by the police but never was) after receiving numerous death threats (33 to be exact, as reported by Berta herself) from, what seems, was a mob hired by Desarrollos Energéticos SA (Desa), the company building the Agua Zarca hydroelectric dam, which Berta had been opposing, and whose owner is Roberto David Castillo Mejía, a former military intelligence officer, and secretary is Roberto Pacheco Reyes, a former justice minister. It hit the headlines on a worldwide scale, with even last year’s Oscar winner Leonardo DiCaprio mentioning it in the Grammy Awards. Musicians from Latin America such as Café Tecuba and Calle 13 both spoke up, too. Human Rights Watch and Global Witness have ramped up their voice on an international scale in recent weeks much to the dismay of the current Juan Orlando Hernandez government who have wanted to push this somewhat “difficult issue” under the carpet for the past year, especially as his election campaign is now in full swing and he’s throwing his might around to be re-elected which not so long ago was against the Honduran constitution and was one of the main reasons why former president Mel Zelaya was ousted from power back in 2009. Here too, Berta Cáceres hasn’t really gone away. 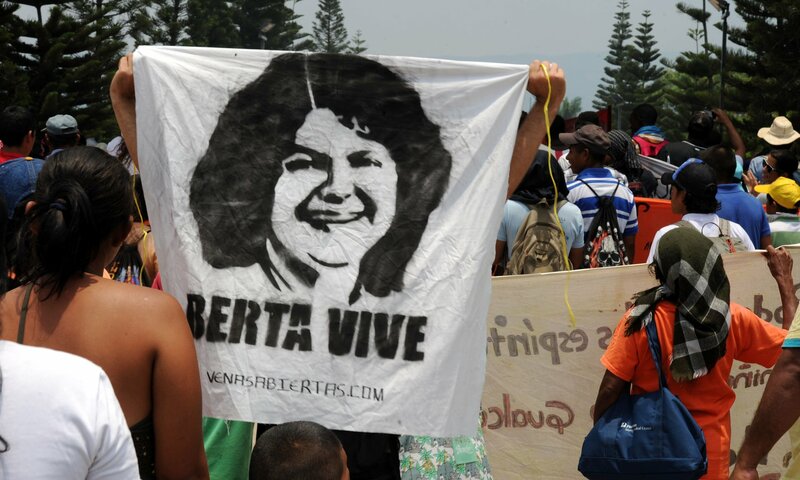 In fact, the title of the protest suggests just that, Berta Vive (Berta Lives), which is a genius name really, because if I were somewhat responsible for her death, it would give me the coldest of tingles down my spine. Her name and face can be seen in graffiti about the country, but especially on government buildings and property, with good reason, too. But what has really changed since last year? Seven more murders of environmental activists to begin with, more or less 120 since 2010. Eight arrests have been made, two of which are ex-military and another a soldier who was in service at the time of the murder but has since been disbanded, all of whom were trained by the US. All of this sits very uncomfortably close to President Juan Orlando, who gives large chunks of government funding to the military (as opposed to education and public health) and makes no secret of his support for them, constantly thanking them for the dropping crime levels supported from what I am told are bogus statistics. What’s more, Hondurans will feel even more less likely to march and protest, after President Juan Orlando himself somehow managed to pass an act that can try protesters for acts of terrorism, due to the growing criticism of the current government. I have no idea if this puts myself and this blog in a precarious situation, although I doubt it because hundreds of other blogs are saying much the same. Watch how fast this law is overturned, however, if Juan Orlando loses the next election. I hate to say it though, with the scams that JOH has already pulled that make Machiavelli’s guide look like an outdated pamphlet in the art of political trickery, he’s a cunning man and is unlikely to lose. Sadly, a year on, nothing politically has changed. If anything, it’s worsened, with Honduras being the closest thing to a police state. One element still persists though, and that is Berta Cáceres memory, and anger. You may well have noticed that I have been including a few articles in Spanish on my blog. The main reason for that is my freelance work with some Honduran newspapers, which I must say, I very much enjoy. There is a bit of an ego kick about seeing your name in print. It’s been a little while since I’ve seen it. Without wanting to blow my journalist trumpet, the newspapers seem to like my work, so I’ll keep it up. Today, a private student I have from Spain asked me if I wanted to be involved in a project with IOM called I am a Migrant (#iamamigrant). I actually took part last year when he wasn’t in the role, but I had completely forgotten I’d done it and failed to mention it on my blog. I was basically an article about how it felt being an immigrant in Honduras. I remember it was released in the run up to the Brexit vote when there seemed to be an air of hostility in the air. I felt quite detached from it in Honduras. Even more so because Hondurans have treated me so well, being the hospitable folk they are. Yes I get called gringo, I get stared at strolling down the street and charged a wee bit more by taxis and immigrant lawyers, but that seems like nothing to the abuse immigrants get in the UK. I try to defend Brits by saying there is less segregation like there is in the United States, people are not too fussed if you are Latino and we enjoy living in a multicultural society, but I seem to have lost touch with British reality and I get my opinions mainly from what I read in the British press, and what I read is grim. The mood seems to have only intensified since Trump came to power, the terrorist attacks and the surge of far right wing parties throughout Europe, not to forget Milo who has recently been smoked for crossing the line; a line it seems is too fine for even far right wing Americans. I guess Brits have something to learn from Hondurans. It’s something of a full circle for me. I worked closely with IOM at the Refugee Council. Sadly mainly to sign documents for failed asylum seekers or refugees who were being forced to go home. IOM ensured that they arrived in their native countries safely. I’m glad that IOM does a slightly different job in Honduras by supporting people returning from the USA who have been in detention centres, etc. They also help with asylum applications for those who need to escape the country because their neighbourhoods are full of gang members and are threatening violence and death to members of the family. Here is my contribution to the campaign anyway.